Contains two bags of Clay. For use with I01805 Super Pottery Wheel…. Make all kinds of shapes you can imagine with your hands with this pottery clay. Kids can get creative and design pots, plates and vases!No baking required. Includes 1kg of clay and 6 paint pots. This toy costs approximately £2.99 (for the latest and best prices make sure you check our retailer list for the Pottery Clay Refill above). 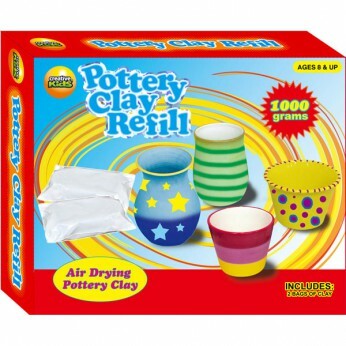 In our review of Pottery Clay Refill we classed it as being suitable for ages 6 years, 7 years, 8 years but recommend you check the manufacturer specific advice before purchasing.